Artificial grass or turf is a great way to get the perfect lawn without any of the hassle of real grass. It needs only minimal maintenance and looks great. Artificial turf is easy to care for and the installation process is quick and easy. Artificial grass can be installed on nearly every garden, so even if you’ve got a steeply sloped lawn, you’ll find that artificial grass is a great alternative to real grass. A few years ago, artificial grass was expensive and difficult to maintain, used only on sports pitches in the more traditional “astroturf” style. However, in recent years the technology has improved significantly. New third-generation systems are cheap to purchase and install, and have an impressive lifespan, even with very little maintenance. Looks just like real grass. Artificial grass has been developed specifically to look like real grass, and there are lots of different colours and styles on offer, so you can have the perfect lawn. Minimal maintenance. Artificial grass requires significantly less maintenance than real grass. There’s no watering, trimming or feeding required, just very infrequent cleaning. Not affected by weather. Unlike real grass, artificial grass isn’t affected by the weather. No need to worry about your grass looking tired or faded in wet weather or long dry spells. Can be laid on most surfaces. Most modern artificial grass systems can be laid on a huge range of surfaces, including soil, turf, and concrete. Also, it can be laid on sloping areas. Drains like real grass. Modern artificial grass drains just like real grass, so you don’t need to worry about it getting waterlogged or turning muddy or boggy in wet weather. Wide range of options. 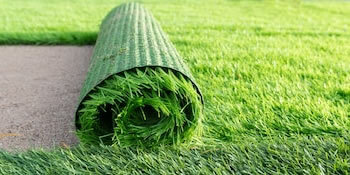 Artificial grass is available in both short and long pile options, as well as heavy duty alternatives if you need them. Artificial grass is ideal for children and pets, so you can choose the right option for your needs. Artificial grass is a fantastic addition to any garden. Offering ease of maintenance and great looks, it’s become a popular alternative to real grass. If you’re struggling to maintain your current lawn, or just looking for a change of scene in your garden, consider switching to artificial grass. If you’re looking for an artificial grass installation service, just fill in the form below. We’ll match you with up to four trusted artificial grass installers, so you can get a range of quotes and pick the perfect tradesperson. Project: Supply and lay artificial grass in my back garden. Small garden and straightforward job. Project: astro turf to be put down in small garden. Project: Artificial grass 30mm for an area approx 7m x 6m. I’d also like a patio relaying. All flags are there, just needs levelling approx 2m x 6m. Old grass has already been removed. Project: Great, what do you need done? Redesign of Garden Ok, so what product are we talking about? Artificial Grass Replace current turf and flower beds with fake turf. Great communication and easy to book a quotation. The guy Stuart who came to do the quote was lovely, really friendly, helpful and clearly knew what he was talking about. Quote came through quickly too. Poor. Didn’t show up for appointment. Attended as arranged, measured up and sat in his cab and worked out a quotation. Whether that was sufficient time to work out a price is questionable but that is obviously how they work and it must be okay for them. quoted good price which was amended at my request to provide a superior quality product.. work was done to time and I am very satisfied with the .job.and I have asked for a quote for further work. Your recommended tradesman proved excellent for the work required.